Bill Hybels has said that the local church is the hope of the world. I believe him. I love the church. I want to serve it. And there is nothing like being apart of a growing and thriving community of faith. I am so blessed to be apart of StoneBridge Christian Church. You guys are awesome. 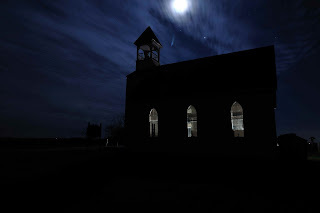 This is a light painting of a church in WI that Justin and I did. I like this one because I had Justin just shine the light through the windows on the other side of the building. The only other light source was the moon and I believe Jupiter. The bright star by the moon.